The ingredients listed call for Black tea for the Bara Brith loaves. I don't generally have Black Tea on hand and was wondering if Green Tea could be substituted in this recipe? Everyone who tries this bread comments on how unique the flavor is and then asks what's in it. I've wondered if it isn't the black tea but now that you've asked, I think it's high time I tried one of my favorite green teas--Jasmine Dragon Pearls (I buy a version from Tealyra that doesn't have "natural flavors"). I think I'll make a stronger version of it than I'd drink and give it a try. Or maybe I'll try a chai or a loose leaf green and compare the flavors of those with the loaves I still have in my freezer that were made with black tea. Thanks MaryJane! I guess it won't hurt to experiment a little. Better get the bakers hat and apron on. Two loaves of Bara Brith out of the oven. It smells heavenly. I did use green tea and will try the Black tea next time when I have some. Can't wait for afternoon tea and a slice of Bara Brith. Janet your loaves are beautiful. Well done. Thank you Sara. My husband and I just had a slice and is it ever good. A keeper for sure! I noticed your Danish bread slicer. Love the color. Mine needed its blade sharpened. Your bread looks amazing. Just finished my second loaf. Gorgeous Bara Brith! Love your James Beard quote. Thanks Sylvia and MaryJane! Yes, I use the bread slicer daily, really handy. Didn't even know they existed until I saw the one in MaryJane's Wild Bread book. Janet, how long have you been keeping a Refrigerator Mother in order to create the loft we see in your Bara Brith? And what kind of flour did you use? Your loaves are perfect! Hello MaryJane. I made the loaves from refrigerator mother, I suppose it's been in the refrigerator over a couple of months now. I actually have a couple refrigerator mothers, one marked Sunday, and the other Tuesday, and one counter mother. I used your Baron Flour Mill Organic White Flour for these loaves. I will try Kamut next time. Proofed the dough in the Brod & Taylor proofer. The rise was beautiful and the loaves so tasty. I may try to "bake twice" a few slices (Twebak) or Rusk for tea. The flavor of my bread is so close to the chai tea that it will be the next tea I'll try with this bread. It can only enhance an already flavorful bread. What beautiful loaves of bread, Janet! Experimenting with different types of tea is a wonderful idea. I think the black tea adds to the complexity of flavor and gives it that "what's in this?!" factor. Other teas would add their own unique flavor to the loaves. I wonder if a loaf made with green tea tastes even better with a cup of hot green tea? Additionally, I think soaking the raisins, currants, and ginger in tea overnight make the texture so wonderful. The springy texture reminds me of cinnamon-raisin English muffins, but with much more happening in the flavor department. Good morning Ashley and Sylvia. Yes, I'm sure the black tea adds to the flavor and I will definitely try black tea as well as the Kamut flour next time. I did it this way mainly out of necessity as I didn't have the other on hand. I tasted the water that soaked the fruit overnight and it was quite flavorful. I just enjoy everything about this bread. Two more loaves of Bara Brith, this time using Black tea and 1/2 Kamut flour and 1/2 Baron white flour. They turned out beautifully. Thanks Sara. We love it toasted with our breakfast, so seems like I'm always making more loaves. I'd call that perfection! Thanks for sharing your handmade jewels. Thanks all goes to you ladies and the Wild Bread Book. Couldn't have made it if it hadn't been for such great instructions and recipes. Another pair of beautiful loaves of Bara Brith, Janet. When you taste this batch, I'm anxious to know if you notice a difference in flavor between black tea and green tea? I'm really intrigued by the idea of playing with different flavors of tea for this bread, and wonder how different types change the flavor. Well Ashley, after eating slices of barn brith made with the black tea, alone and toasted, there is a difference in flavor, not a huge difference, however the black tea did impart a more distinct flavor, perhaps enhancing the spices and fruit. The barn brith loaf that I made with peach oolong tea was quite wonderful also for flavor. The green tea was good but the flavor wasn't as enhanced. But I didn't stick with just the Baron White flour for all loaves so that has to be considered too. I used Kamut flour also. All too much fun and delectable delight. Janet, you are such an inspiration and it shows in the wonderful loaves that you share photos of!!! Cross your fingers and your toes, I am starting my first mother tomorrow. I am going to go with the white rice flour first and see what happens. Well, here goes another test of my patience!! Ahhh yes, patience. It will soon be worth it Darla. 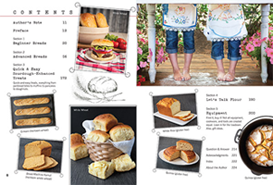 All the different loaves of bread you will be mixing up and sharing with your family and friends. 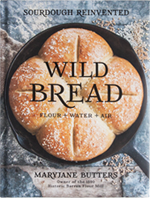 Until then, just read through the Wild Bread book again and enjoy the recipes, tips and photos. Your mother will be ready to do her thing and show off beautiful loaves in no time. Happy for you. Janet, your loaves are beautiful to look at and no doubt, delicious. I've been doing some research on Irish breads. Low and behold, the Celts do stick together. The Irish version of this bread is made almost identically (they soak in black tea, use lemon zest along with orange zest) but it is traditionally baked in a round pan. Saw one baked in a bundt. They started making this bread with leftover beer yeast. It is known as Barm Brack. Nowadays it is made with bread yeast. Considered a breakfast/tea bread. So glad the book version is sourdough. All the flavors in this bread are amazing. I am trying a different tea. It is black but is known as "Hot Cinnamon" tea. It's hard to drink no matter how much I try to dilute it with more water. It'll make a fun bread. Baking some BB today. Thank you Sylvia. I love Italian Panettone, so the Bara Brith, with all the lovely currants, raisins, orange zest and ginger, will always be a favorite. You loaf using the hot cinnamon tea, I have no doubt will turn out lovely and tasty. Be sure to share the results. Anxious to hear how it turns out Sylvia. Enjoyed your bit of research. Barm Brack. Now for an Irish tune or two.